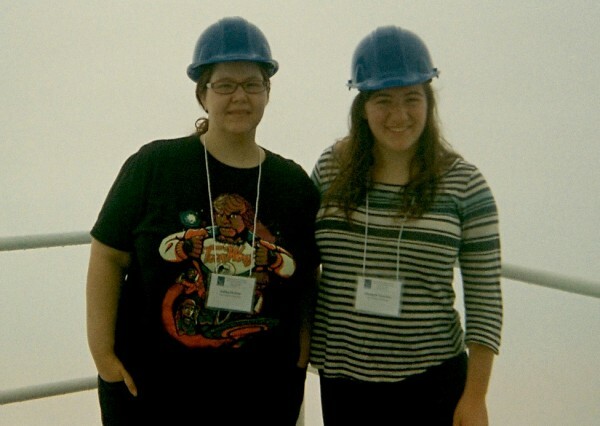 In July 2015, undergraduate student Elizabeth Tarantino and graduate student Ashley Shukayr had the opportunity to attend the 8th NAIC/NRAO Single-Dish and Interferometry school in Green Bank, West Virginia. Ashley Shukayr and Elizabeth Tarantino touring NRAO’s Green Bank Telescope. The aim of the NRAO Summer schools is to teach young astronomers about the details of observing in radio astronomy. The first seven days of the school were on single-dish radio astronomy while the next three focused on interferometry. During the day, we attended an intensive series of lectures given by experts in radio astronomy, ranging from signal processing, continuum and spectral line observations, and receiver technology. In the evenings, we were given hands-on projects that used the 305-meter Arecibo Telescope to observe and take data. Elizabeth’s project was to detect and measure the period of a pulsar and Ashley’s project was to observe OH masers. For the interferometry school, we were given an ALMA data set to learn about imaging and calibration techniques with the Combined Astronomy Software Applications (CASA) package. Additionally, the school also provided tours of the 100-meter Green Bank Telescope and its control room. Overall, the trip was an extremely educational and fun experience. We were able to meet other astronomers across the globe and connect with experts in the field. Elizabeth and Ashley would like to thank the organizers as well as our adviser, Professor Stacy McGaugh, for providing the funds for us to attend.